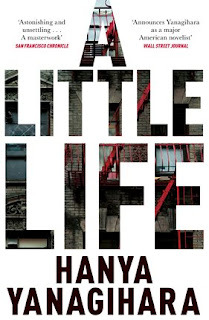 If you go by social media, Hanya Yanagihara's A Little Life is either the most amazing, emotional, poignant book ever written, or it's an ill constructed, ridiculous, far too long brick, and there is no in between. Well, I'm here to say that I'm the in between. There are moments of A Little Life I think are sheer genius, where the beauty of Yanagihara's prose can't be denied, and then there are moments where I think the book is just full of holes. A Little Life follows four friends - Jude, Willem, JB and Malcolm - in New York after they graduate. The novel quickly focuses its beams on Jude, who is a powerful, brilliant lawyer, but who is deeply affected by an awful childhood which has left him scarred in numerous ways. As Jude grows older, he becomes more and more unable to let the demons of his past go. Yanagihara's novel is billed as the tale of four men, but really it's not. We soon lose sight of JB and Malcolm (especially Malcolm), who then only pop up occasionally, and often to serve a particular plot point before disappearing. Willem, who is far closer to Jude, continues to play a significant part in the book and in Jude's life, but I expected to be reading a book exploring male friendship, and what I actually read was a book about one man and how he connects, or not, with the people in his life. I got over the hurdle of not reading the book that A Little Life is billed to be, mainly because Yanagihara is so good at writing Jude, and Willem, and also Harold, the man who goes from Jude's professor to his adopted father. For all his many, many faults (which the other characters often seem blind to) I did love Jude. He can be bad tempered, and is completely irrational about many things, but he's also endearing and loveable, and I can see why he inspires such strong feelings from so many of his friends, feelings which are wonderfully described in the all too brief sections where we hear from Harold. A Little Life is an emotionally draining book. I knew it wasn't going to be an easy read, but it's almost too difficult. Jude's horrendous past is revealed slowly through the course of the novel (which clocks in at more than 700 pages), and knowing that graphic detail about what Jude faced as a child was ahead made me often reluctant to go back to the novel. At times the detail was too much - I already felt horrified and disgusted by what Jude went through, the detail didn't do anything but make it more difficult for me to go on. Similarly, in the present time having to read in incredible detail some of the things Jude puts himself through was effective the first couple of times, but after being repeated again and again I felt numb. I also felt there were big plot points that I couldn't buy into. One of them concerned Jude's past, and when it was finally revealed, I just felt like it was an unbelievable plot point, taken straight from a really bad horror movie from the 1970s written by a teenager who thinks over the top melodrama is the height of good stories. If that particular part of Jude's past had not occurred, I think the book would have been so much stronger, and I would have forgiven some of the other parts of the story I did not buy into - why Jude's friends, who love him so fiercely, fail to take action to help him time and time and time again; how Jude, JB, Malcolm and Willem all become so phenomenally successful; why Malcolm, who we barely know, is handled the way he is by Yanagihara. 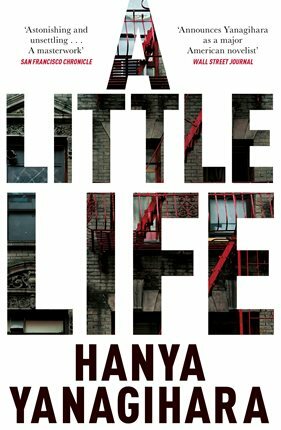 But for its faults, A Little Life is an engaging book. It's not a happy one, but it is captivating, powerful and moving. Yanagihara is brilliant at capturing little moments of friendship and love on the page, and despite how difficult it felt at times to read this book, I am glad that I did.